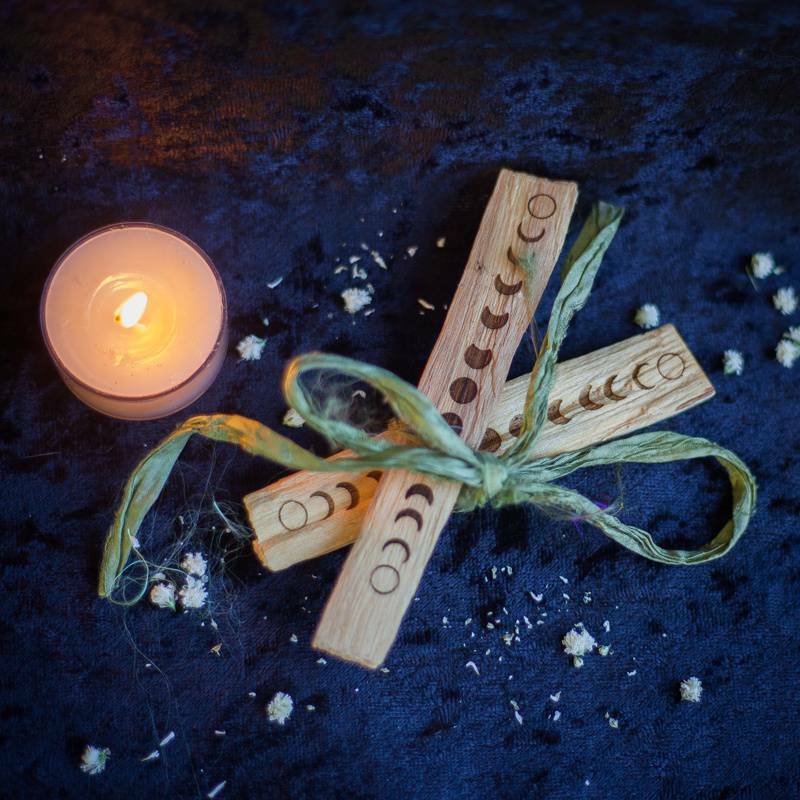 When the magic of the moon combines with the healing, clearing power of palo santo, you get a potent talisman to aid you in your spiritual work. This moon phase engraved palo santo is a combination of moon and indigenous medicine that will keep you and your spaces feeling clear, receptive, sacred, and flowing — just like the phases of the moon. 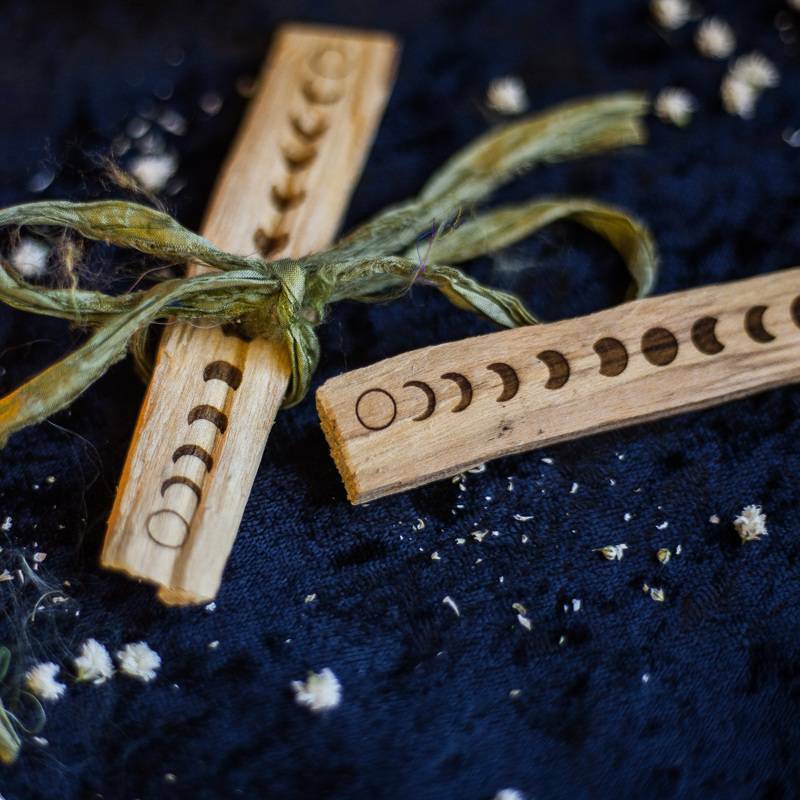 A staple for healers, this moon phase engraved palo santo comes with two pieces of palo santo tied together by a strip of sari silk. 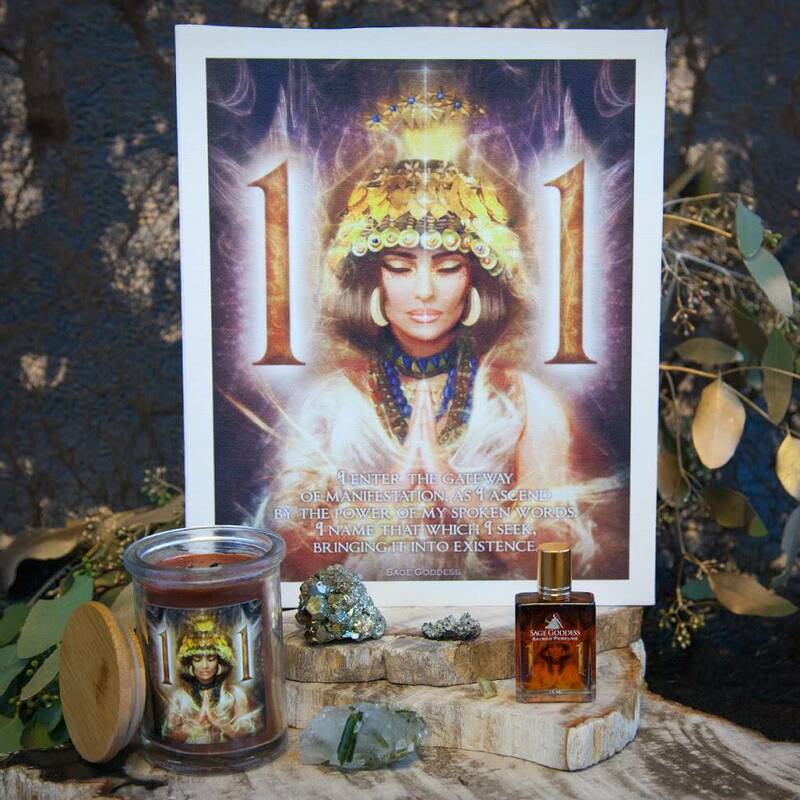 Use yours when you need an extra boost of cleansing energy and as a reminder that we are all a part of a moving phase of energy! Palo santo is a sacred wood from Peru that has been used as indigenous medicine by shaman and medicine people of South America for hundreds if not thousands of years. 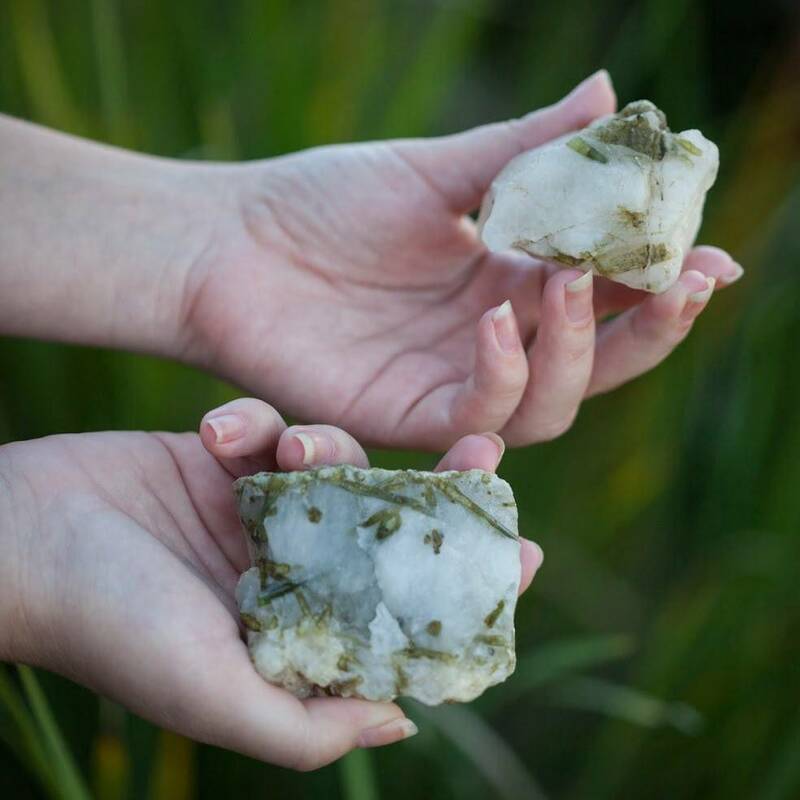 When compared to white sage, the scent is sweeter, rounder, and more mellow. It’s also a lighter burn than white sage. To use, light one end of the wood. It will self-extinguish. Then, fan the smoke around you or your space to clear illness energies. Always burn on abalone shell or heatproof surface. The moon is a deeply feminine symbol and serves as the middle ground between the light of the sun and the darkness of night. In this way, the moon can be considered the bridge between the conscious and unconscious. All moon work begins at the New Moon – when the sky is dark. This moon phase serves as a time for opening and visioning work, setting intentions, releasing fear, and leaning into faith. The next major moon phase is the waxing moon. This phase is all about the emergence of light, commitment to intentions, and gathering tools for the work ahead. Following the waxing moon is the almighty, all-powerful Full Moon. This phase is about celebrating fruition, bathing in the light, receiving and opening wide to what is available. During this phase, we experience a complete release of fear and surrender to the present moment. As she completes her cycle, we celebrate the waning moon. 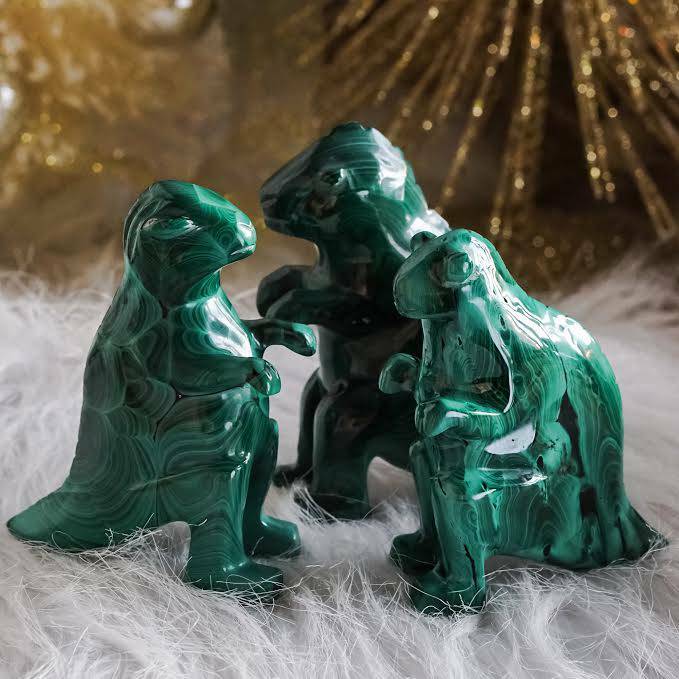 This phase is centered on cleaning up from the creation, gathering tools to begin the descent, honoring and giving thanks, and allowing the energies to be anchored. Use your moon phase engraved palo santo during each lunar phase, clearing the space for higher vibrations to flow unobstructedly into your sacred space. This listing is for one (1) 2-pack of moon phase engraved palo santo. Yours will arrive lovingly parceled for your enjoyment and delight.